Candy Pumpkin Boxes – AMAZING! 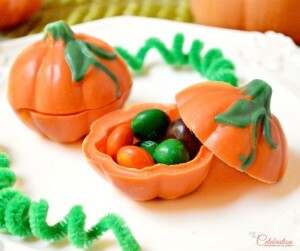 What an absolutely fantastic and delicious idea, perfect for the Halloween season! We are definitely doing this in our household this Halloween. This awesome kitchen project uses Wilton candies melted into molds which are then filled with candies and then topped with another candy lid to keep all the candy goodies safe inside. Posted in BLOG and tagged candy filled pumpkins, chalk, chalkboard, fun halloween ideas, Halloween, Halloween treats, kids halloween, Major Moments, pumpkin candy box, pumpkin filled with candy. Ok this looks like crazy fun! Where do you find all these ideas! I’m going out to bulk barn tomorrow and going to do this with the kids when they get home from school.